Garver is again involved in Bike to Work Week activities and encouraging commuters to ditch their car keys May 14-18. Our employees are involved in a number of ways this year, which includes leading multiple rides to our office in North Little Rock and providing coffee and snacks for other bikers who are pedaling through the Northshore Business Park. Below is a list of organized events near Garver offices. Specific meeting times, locations, and routes are available by clicking on the highlighted links. And if you know of any other events in a Garver city, let me know and I'll add it to our list. Happy biking! 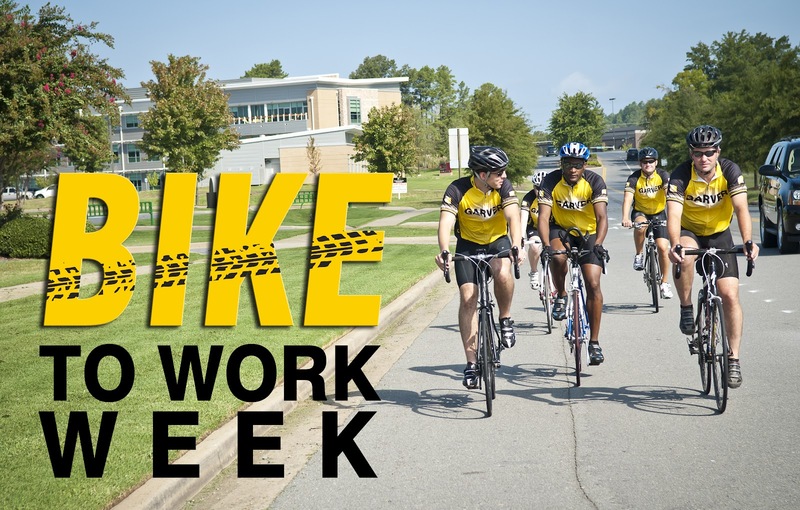 To kickoff Bike to Work Week, Lawren Wilcox is organizing bike maintenance services for Garver employees. This Friday (May 11) from 11:30-12:30, Lawren and others will provide free basic services such as tires inflation, chain lubrication, shifter and brake adjustment, and bike fit. If you need a tune-up to prepare for Bike to Work Week and the cycling season, want to learn a little about bike maintenance, or need help with your kids' bikes, please join us at the recreational storage in Building Two. Bike to Work Day (Friday, May 18). Arkansas Outside has posted biking routes from Little Rock, North Little Rock, Maumelle, Sherwood, and Conway. Several Garver employees are leading convoys to our headquarters in North Little Rock: Lawren Wilcox is leading a group from West Little Rock and will meet up with a Bert Parker group coming from the River Mountain Road boat ramp; Diane Barton is taking a group from North Little Rock Park Hill. Both Lawren and Diane will be leading return trips later in the day. Arkansas Outside has also provided information about bike storage, shower locations, bike store and rental discounts, and sponsor locations with free snacks. Additional information is available on the Facebook page Ditch the Keys. Ride of Silence (Wednesday, May 16). A memorial ride to remember bicyclists killed or injured in traffic crashes. Kick-Off Proclamation and Urban Ride (Friday, May 11). Mayor Lioneld Jordan will read the Bike to Work Week Proclamation, and then an urban bicycle ride will begin. Bicycle Commuter Challenge (May 13-19) The workplace with the highest percentage of bicycle commuters on any single day has the chance to win great prizes. Register your commute and report your daily rides to enter. Free Workshop Series (May 14 and 18). The Indian Nations Council of Governments has organized a number of training workshops for bicyclists. Remaining events include "Bike Racks Around Town," which explains where nearly 100 bicycle racks will be installed in Tulsa, and "Bike to Work Day Celebration." Green Traveler is a website that offers bike routes in Tulsa and information on a bike commuter challenge. Bike to Work Central Oklahoma (May 18). The Association of Central Oklahoma Governments is helping coordinate Bike to Work Day rides for for numerous communities, including a route in Norman. Additional information is available on the Bike to Work Central Oklahoma Facebook page. Although Houston has already had its Bike to Work activities, Bike Houston is a Facebook page dedicated to making Houston a bike friendly city. Ride of Silence (Wednesday, May 16). A memorial ride to remember bicyclists killed or injured in traffic crashes. Events are planned in Plano, Dallas, Fort Worth, and Houston. Irving Bicycle Fest (Saturday, May 19). Planned events include group rides, kids' bicycle safety, bike repairs, and a safe route finder. Tour de Nash (Saturday, May 19). Family rides and longer tours are scheduled. The Tour de Nash will celebrate the grand opening of Nashville's new bike facility, the Music City Bikeway. This 26-mile route connects Percy Warner Park with Percy Priest Dam via Downtown on a collection of greenways and safe on-street facilities for bikes. Bike to Work Day (Friday, May 18). Walk/Bike Nashville has a website and Facebook page with information on bicycling activities. Walk/Bike Nashville is coordinating group rides to all areas of Nashville/Greater Nashville area. For more information, contact Whit Smith at whitfield711@gmail.com.